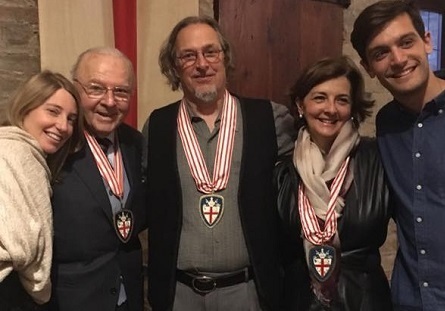 This important La Morra cantina has become, under the passionate leadership of Maria-Cristina Oddero, her niece Isabella, son Pietro and enologist Luca Veglio, one of the most important standouts of the neo-traditionalist movement in Barolo. With a beautiful, brand new cellar and a stable of some of the best, organically farmed vineyards in all of Piemonte, this newest generation of a property that has been making wine since 1878, is on a major roll! While it’s still possible to find bottled Oddero wines back to the 1960s, it was in the 2006 vintage that Maria-Cristina took over from her father and uncle and began a renovation of the cellar which continues to this day as well as the conversion of all their many vineyards to organic farming. The results have been staggering and the Odderos’ wines, while not substantially changing in approach, have grown incredibly in style. An Oddero wine is always serious, structured and limpidly pure. The cantina’s flagship Barolo Classico. This is the wine that put the new Oddero regime back on the map. Hailing mainly from the Bricco Chiesa cru that surrounds the Oddero’s Santa Maria di La Morra cantina and the important Bricco Fiasco (of Scavino and Brovia fame) in Castiglione Falletto, this is the standard bearer- the Barolo that best shows where this seminal winery has been and where it is headed. The single vineyards bottlings come from some of the best sites in all of Barolo. The exotic Villero, powerful Brunate, and perfectly balanced Rocche di Castiglione are released four years after the harvest while the iron-fisted Mondoca from Bussia is released a year or two later as a Riserva while the incredible Vignarionda from Serralunga, made only in the best harvests, is released only after a decade in the cellar. In addition to their fabulous collection of Barolos, the Odderos also farm Gallina in Barbaresco and produce a wonderful Barbera d’Alba that we think is one of the world’s best bargains!